It is so realistic, you can almost hear the sound of the Mallards taking flight in this detailed artwork by David Maass. 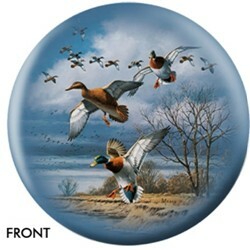 Due to the time it takes to produce the OnTheBallBowling Nature Mallards ball it will ship in 1-2 weeks. We cannot ship this ball outside the United States.